Welcome To Beet Street Yarn Co.
Beet Street Yarn Company, wholesale distributors of Kauni Effektgarn & Solids, The LOOM Silk Yarns and fine patterns. We are passionate about providing the best natural fibers and yarns to the finest shops across America. Beet Street Yarn Company’s mission is to support our friends in yarn shops with great value yarns and bring the fun and relaxation back to fiber. Check out What's New on the street! Watch monthly for the promotion of one of the gorgeous Kauni Solid colors along with other Kauni Solids and Effektgarns colors that accent beautifully with the color of the month! Sign up to be on our email list or follow us on Instagram to see the colors of the month. The Silk 3-Ways scarf is designed to show off the beautiful textural qualities of the 3 LOOM silk yarns (Fusilli-80, Risoni & Speck). Each kit includes the 3 yarns in coordinating colors, the scarf pattern, and come in a cute pie container to display. Needles not included. This beautiful new combination of colors go from Black, Charcoal, Grey, to Teal, and is a great addition to the many stunning color gradients already from Kauni. Kauni Effektgarns newest color is a stunning combination of Orange, Red & Purples that will have you dreaming of sunsets and warm fall days. Kauni color of the year! Kauni ZZ1 is a lucious rich teal perfect for any project and is our 2018 color of the year! New design from Lismi Knits features a stunning mosaic pattern using Kauni Effektgarn. This pattern can be customized to be a shawl/wrap, loop scarf, or cowl! Kit includes 2 skeins of Kauni Effketgarn, cardboard caddy, label and pattern. This scarf shows off the beautiful & unique textures of each yarn, plays with different colors & stitching techniques, & finishes with trendy tassels. Each kit includes a skein each of the LOOM Piega, Risoni, Speck & Fusilli-80, kit packaging & pattern. Needles not included. Kits are sold in a set of 14: 7 of the Day colorways & 7 of the Night colorways. 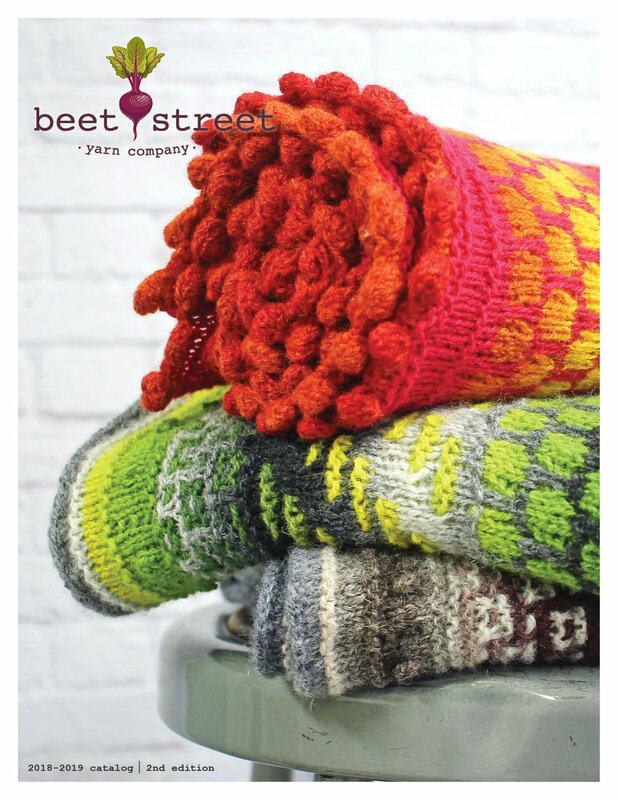 Click Here to follow us on Instagram and see even more wonderful things from Beet Street Yarn! We are passionate about providing the best natural fibers and yarns to the finest shops across America. Click on the image above to view our 2018-2019 catalog featuring all of our beautiful yarns and patterns. Want to receive our what's new and product emails?! please provide your e-mail address below! We do not share your information with anyone else, we use it only to keep in touch with our customers and send you e-mails regarding our products and information.